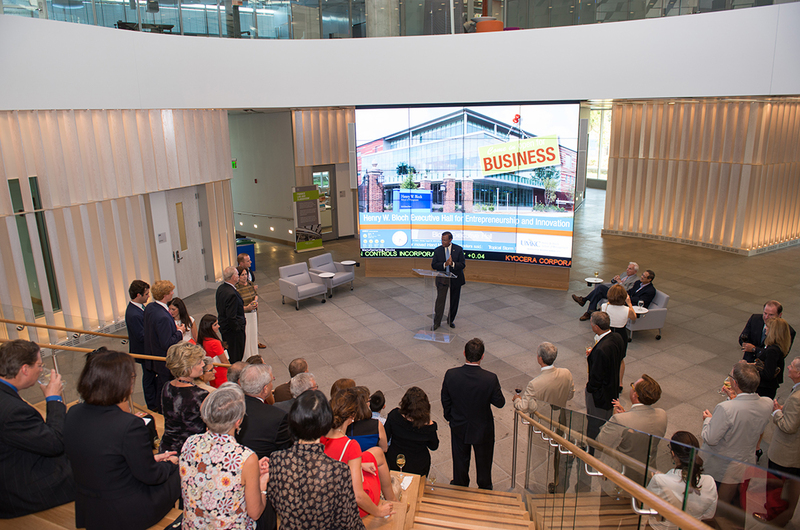 There’s been lots of buzz about the opening of the new Henry W. Bloch Executive Hall for Entrepreneurship and Innovation in the past year, and especially this fall. Students, faculty, staff and friends alike celebrated the opening of the 68,000-square-foot facility at a special event on Aug. 27 that included a program with remarks from the leadership behind the new facility, including special guests UM President Tim Wolfe, Bloch School Dean Teng-Kee Tan, and the man who made it all possible, Mr. Henry W. Bloch. The Bloch Executive Hall is the newest addition to the Henry W. Bloch School of Management campus, which now consists of the historic Bloch School building (or Bloch Heritage Hall) as well as the Executive Hall, giving students two beautiful spaces in which to learn, collaborate, and succeed. 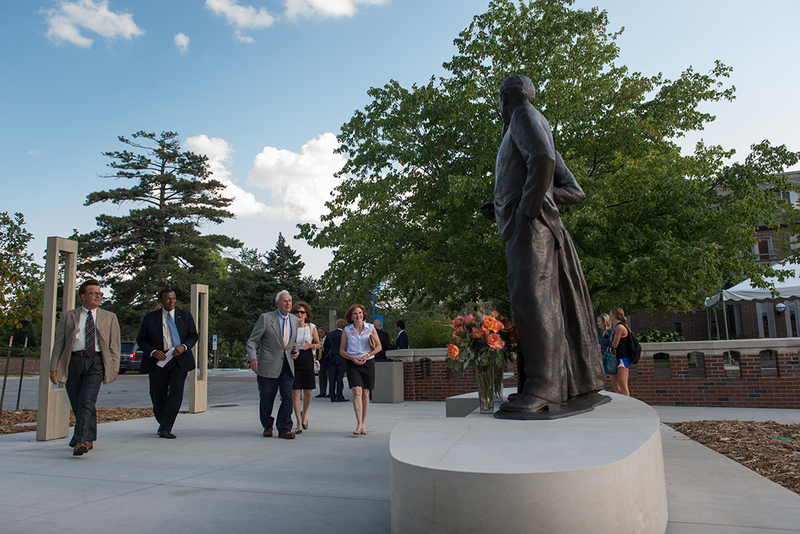 Another special monument was unveiled on Aug. 26 – an eight-foot tall sculpture of Henry and Marion Bloch that graces the space between the Bloch Heritage Hall and Bloch Executive Hall, unifying the two spaces with the likeness of the people that have given so much to the school. Henry Bloch sees the statue of himself and Marion Bloch for the first time, accompanied by his daughers Liz Uhlmann and Mary Jo Brown. UMKC Chancellor Leo Morton addresses guests in the new Bloch Executive Hall amphitheatre. 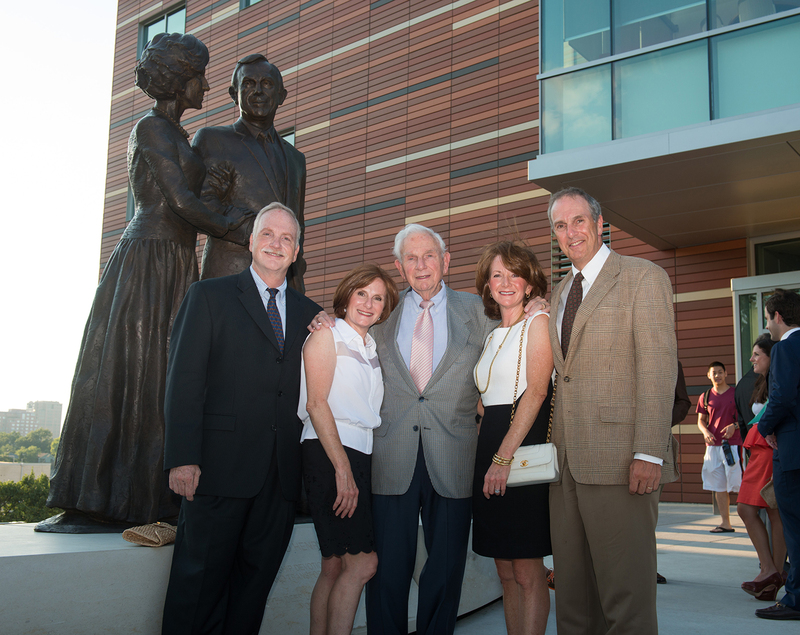 The statue was commissioned nearly two years ago by Henry and Marion’s children, who wanted to commemorate their parents’ generosity and commitment to the Bloch School and to Kansas City. Eugene Daub, a nationally-celebrated sculptor, created the larger-than-life sculpture (called “life and a half” which in sculpture is often done for statues that need to compete with an open or outdoor space, and thus need to be bigger than life-size). Daub and his partner, Dr. Rob Firmin, were celebrated earlier this year for the commemorative Rosa Parks sculpture they created for the U.S. Capitol. 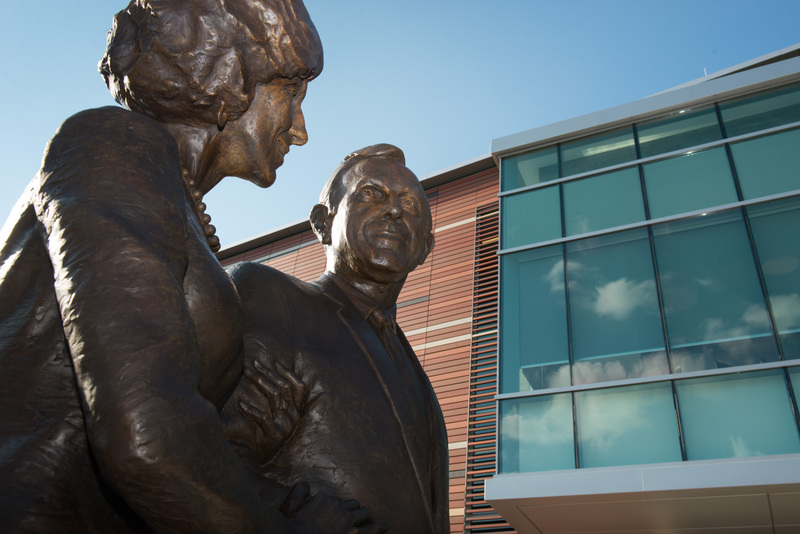 Daub also has two other pieces in Kansas City – the Lewis and Clark and the Corps of Discovery statues in downtown Kansas City.